I am a lover of a flat-soled shoe. This is for many reasons. One being that I have fairly unstable, Bambi-like ankles and am at constant risk of falling over. Add this to the fact that I am naturally clumsy and constantly trip over my own feet, and you could see why heels on an everyday basis could be an issue. 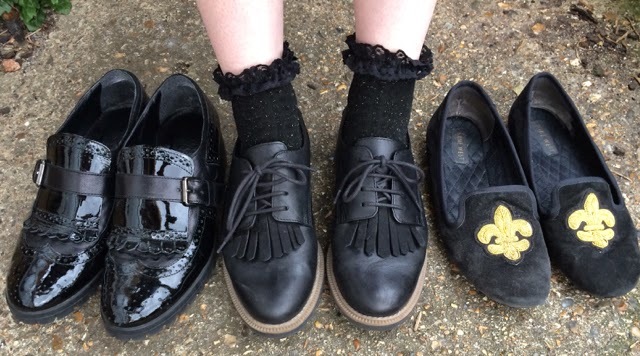 To keep my feet firmly on the ground I have three pairs of trusty black shoes that I like to use in rotation depending on the outfit, situation and weather. My Clarks brogues are my fail safe. They go with anything, I can run for the train in them and they look smart but at the same time aren’t too plain. They also have the added bonus of a cushioned sole meaning they can be stomped around in for hours on end without being uncomfortable. Always a win. Second up we have my delightful Bertie brogues. These are so beautiful to me but so fugly to others. They’re patent, buckled, and have a slight heel to them for when you want a bit of height but no pain. These are slightly dressier so are my go-tos when I need to up the ante. Finally, we have my trusty Nine West slipper shoes. These are only allowed out the house when the weather is dry, as I’m scared they’ll soak up any moisture which will ruin their fine suede. The crest on the toe also makes them look quite regal. All I need is a smoking jacket and for you to call me Hugh. I’m slightly afraid that my other flats – mainly my glittery ones, my KG glitter/leopard hybrid and my Converse – will feel neglected. My shoes are like my children, I love them all equally, it’s just they all have different skill sets. And that’s where I’ll leave it. Do you have a trusty pair of flats?